Whatever your moving needs may be, Meathead Movers will help you feel at home in Carpinteria. Our professionally trained student-athlete movers and our moving concierge will be with you for the entirety of your move to Carpinteria. 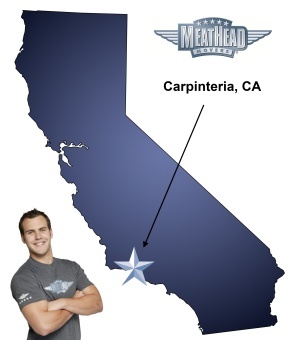 Welcome to Meathead Movers of Carpinteria! One of California’s best small towns for nature lovers is Carpinteria. In the several tidepools near the coastline of the city, residents and visitors can find starfish, crabs, sea urchins, octopuses and other marine life. Take a stroll by the Carpinteria Bluffs to see gray whales breeching or sea lions playing. Visit the salt water marshes close to town for excellent bird watching opportunities. With gently sloping beaches and areas with impressive surfing swells, the town is great for water lovers as well. If you’ve recently taken a job in the area and are moving to Carpinteria, consider the services of Meathead Movers. We guarantee that other Carpinteria movers can’t offer the level of service and quality that we can. Our moving company specializes in local, long-distance, and commercial moves to, from, and within Carpinteria. We also provide reliable packing, storage, on-site relocations, and our distinctive moving concierge service, which connects you with local service providers. Moving can be incredibly stressful, but with Meathead you don’t need to worry since we are here to help you at every step of the way. Not only can we help you move your things, but with our move concierge service, we can put you in touch with service providers such as real estate attorneys, housecleaners, maintenance workers, landscapers, storage services, and junk hauling services. We offer our clients support seven days a week for maximum customer satisfaction. Many people are worried about leaving their precious household items in the care of a moving service. Other moving services hire temporary workers who don’t care about your items or the quality of the work they do. At Meathead Movers, all our Carpinteria movers are clean-cut student-athletes who are trying to work their way through college. They’ll hustle for you just as hard as they would for their coach. In fact, our movers jog to and from the truck whenever they’re not carrying your items saving you valuable time. We also offer fixed pricing for long-distance moves and ensure that the same movers who load your truck also unload your truck, that way you don’t have to repeat instructions and aren’t surprised by additional fees. That’s the Meathead standard of quality, and that’s the Meathead Difference. Moving to Carpinteria doesn’t need to be stressful when you use the Meathead Movers. Our staff is standing by, so give us a call to learn more about the services we offer. We’ll also be more than happy to give you a free moving quote. There’s no obligation and no pressure to choose us. We’re confident that, once you look at all the other Carpinteria movers, we’ll be your top choice. Moving to Carpinteria? Here are some helpful resources.